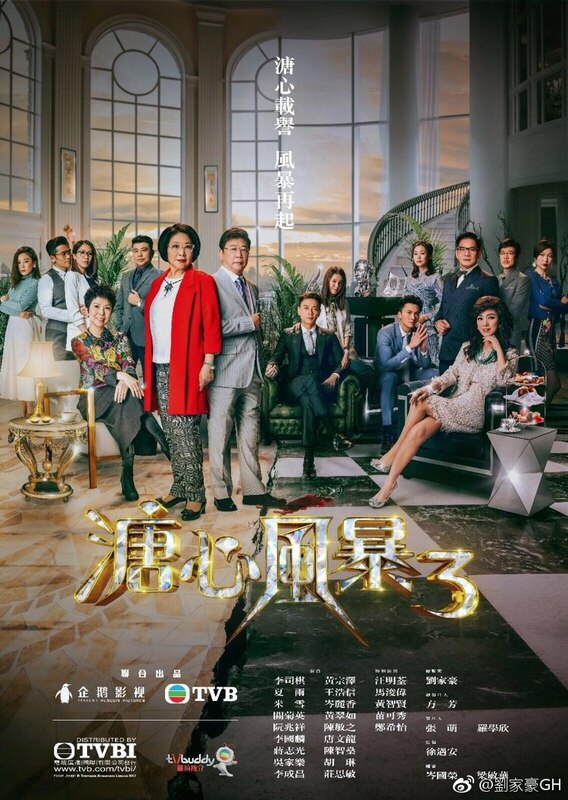 Heart of Greed 3(溏心風暴3) is a TVB modern day moral drama series produced by Lau Ka Ho(劉家豪) starring Louise Lee(李司棋), Ha Yu(夏雨), Michelle Yim(米雪), Susanna Kwan(關菊英), Bosco Wong(黃宗澤), Vincent Wong(王浩信), Eliza Sam(岑麗香), Priscilla Wong(黃翠如), Sharon Chan(陳敏之), along with Louis Yuen(阮兆祥), Joseph Lee(李國麟), Ram Tseung(蔣志光), Michael Tong(唐文龍), and Jason Chan(陳智燊). The drama focuses heavily on the feud between two families over the estate of their multi-million dollar "Cha Chaan Teng(茶餐廳)" chain restaurant and investment business. [Ling Lai Ying/凌麗熒(Louise Lee/李司棋)] and her husband [Wong Wing Ching/黃永正(Ha Yu/夏雨)] turn their small family-owned Cha Chaan Teng restaurant business into an entrepreneurial success involving real estate investing with hard work and dedication. Ling Lai Ying's younger brother [Ling Shing Fung/凌乘風(Bosco Wong/黃宗澤)] tries to help them to get their company to go public. Wong Wing Ching initially hates the idea of the company going public. However, after learning[Alan Hui Nga Lun/許雅麟(Joseph Lee/李國麟)]'s family printing business is about to go bankrupt, Wong Wing Ching agrees to merge the two families' businesses for mutual benefits. In addition, Wong Wing Ching feels indebted to Alan Hui because he once helped him get acquitted of a murder charge years ago. (ahmike.com) Despite that, Wong Wing Ching's sister-in-law [Leung Shun Wah/梁順華(Susanna Kwan/關菊英)] and younger brother [Leung Chan/梁贊(Louis Yuen/阮兆祥)] are strongly opposed to the idea since they have a personal grudge against Alan Hui's wife [Amelia Yu Sau Wai/余秀慧(Michelle Yim/米雪)]. Nevertheless, with Ling Lai Ying's support, Wong Wing Ching reaches a deal with Alan Hui.